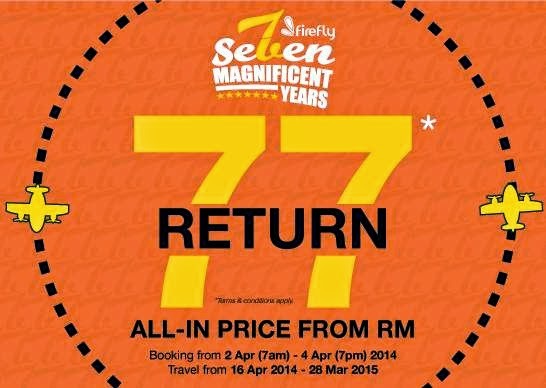 Firefly celebrates Seven Maginificent Years with flight sales from RM77 (return tickets, all-in price)! Fly from Subang to Kota Bharu, Penang, Johor Bahru, Alor Setar, K. Terengganu or Langkawi with all-in price from RM77 (return)! Fly From Penang to Langkawi, Kuantan, Subang and Kota Bharu with all-in price from RM77 (return)! Fly from Johor Bahru to Kota Bharu with all-in price from RM77 (return)! All-in price displayed include surcharges and airport taxes. Promo seats may not be available on weekends, public holidays or school breaks. Other terms & conditions apply.